The small state of Goa in western India is a famous beach destination, and is visited by countless tourists from all parts of the globe every year. Apart from spectacular scenic beauty, they offer tourists an amazing array of Goan, Indian and international cuisine in its shacks and restaurants. To top it, Most popular yacht or boat of Goa provide a host of water sports. Deep sea fishing is a wonderful water adventure activity offered in Goa. It is becoming increasingly popular among the tourists due to the relaxed and leisurely nature of the sport. As the name suggests, deep sea fishing involves going to the greater depths of the sea. 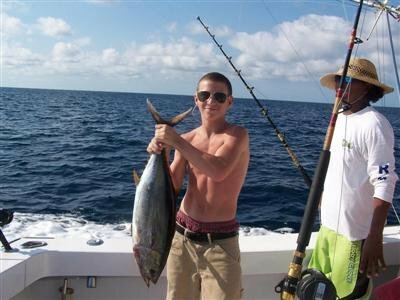 Deep sea fishing takes you to spots where fish are found in large numbers. You will also get a great variety of fish at these spots. Deep sea fishing can be a wonderful. You can involve your family or a group of friends. Weather can be a constraint at times. If you are an avid angler, and are interested in exploring the deeper sea, deep sea fishing in Goa is just the sport for you. Make sure you go deep sea fishing with your loved one during your vacation in Goa.